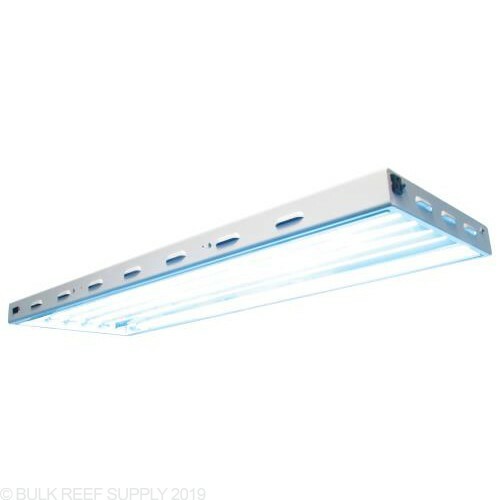 The Sun Blaze is a great fixture for fish only tanks, shallow reef tanks, or lower light reef tanks (LPS and Softies). 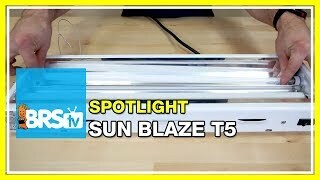 The Sunlight Supply Sun Blaze light fixtures are great for a low-cost option packed full of high-cost features. The Sun Blaze fixtures come with a white powder coated housing for years of corrosion free use. Multiple channels on 8 lamp versions allow you to control which lamps are on at what time. The Sun Blaze comes with advanced reflectors to help give the greatest spread the light for a nice even shadow-free lighting fixture. BRS recommends ATI T5 Lamps for the best mix of coloration and lighting output. Lighting for reef tanks can be one of the hardest choices when it comes to fixtures to buy. There are so many options these days it is hard to know which is going to be best for your tank. Over the years T5 fixtures have been a staple in the hobby and a great recipe for success. T5 lighting will give the evenest spread of any lights due to the length of the fluorescent tube and reflectors. 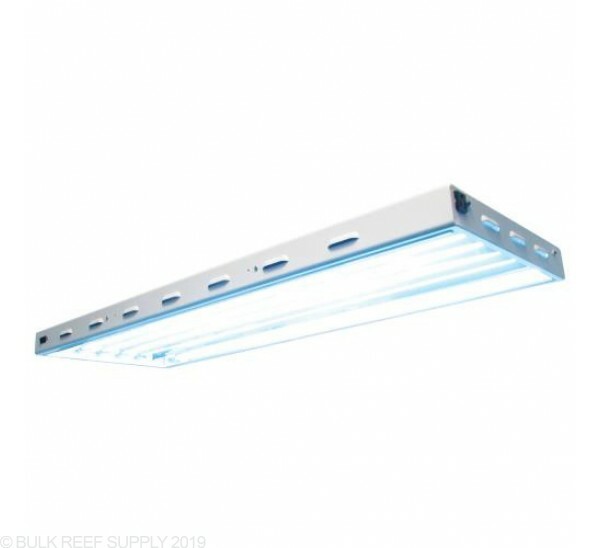 The Sunlight Supply Sun Blaze fixtures are a great value for the price and can be daisy chained for multiple fixtures to be connected together through the power cords. 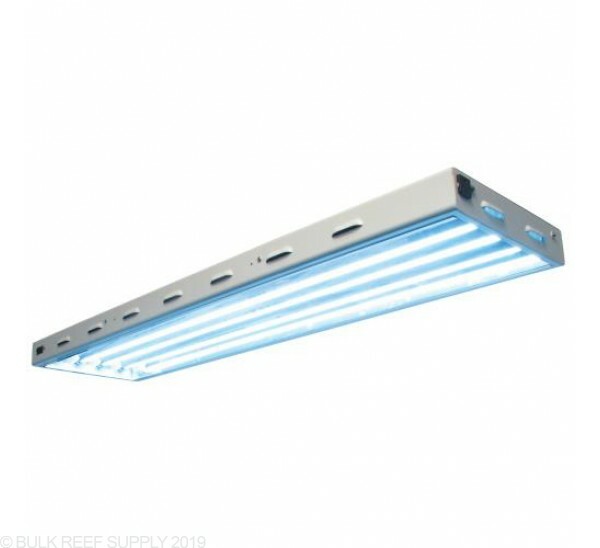 Note: Fixtures come with 6500K Spectralux T5HO lamps which are designed for freshwater or planted aquariums. The 6500K lamps can be used however will give your tank a very yellow look. This light is terrific! Reflectors are top notch... BRS Investigates needs to to a comparison with the ATI. Do a comparison, If the ATI is better, Put and ATI Ballast on the Sun Blaze, see if it's power. Or Swap out reflectors. I'm confident that the light fixture is emitting as much par and wavelength as the $600 ATI...(before paying another 160 for bulbs). I paid 150 for the Fixture and 160 for the ATI bulbs. I could buy 2 complete lights for the same price as 1 ATI fixture only. 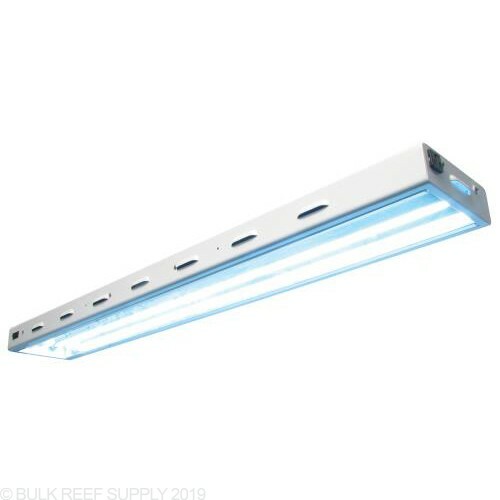 Almost a year ago, I purchased this light 48"x6 bulb to start a new reef tank because I out grew my older systems. I am still extremely satisfied with this particular light. As I said in my first review, it's not a sleek, thin design by any means, but my light enclosure is not visible so it does not matter. The light ballasts are quiet and it does everything I want it to do. I have a very diverse mixed reef, with SPS, lots of LPS, and a few soft corals. I have experienced good growth on my SPS corals and very solid growth on my LPS corals. Bottom line, it's a great light to start with on a budget and still have good results without breaking the bank. I just add the light to my reef setup just as it comes out of the box except I add the legs from an old Odyssea fixture so I did not hang it from the ceiling either. at the moment I have one tang, to tomato clowns, 5 cardinals and Harry, a Pink Urchin. oh also 10 Cerith Snails and they all look and act great under this light. I will add more in a year or so to bring this review up to date with the later status but for now, 5 star! This is a good quality light for the price, it is not very sleek or awesome looking, it's just what it says; a light. I mounted my sun blaze inside a hood so I'm not worried about the look. But it's a great fixture and does everything I wanted it to. I did purchase the ATI lights to go in it, and I'm very satisfied. I'm building a new tank and I'm going to have it heavily sps with some lps corals. Will the 4 foot 6 bulb be able to produce the light to make the colors of the corals the best they can be? What are the dimensions of the fixture and does it get hot to the touch like the coralife version almost like it could burn you? The fixture will be 48" long and range in width from 10" to 24" . These will get warm and almost hot however should not get hot enough to burn. Feel free to let us know if you have any further questions! 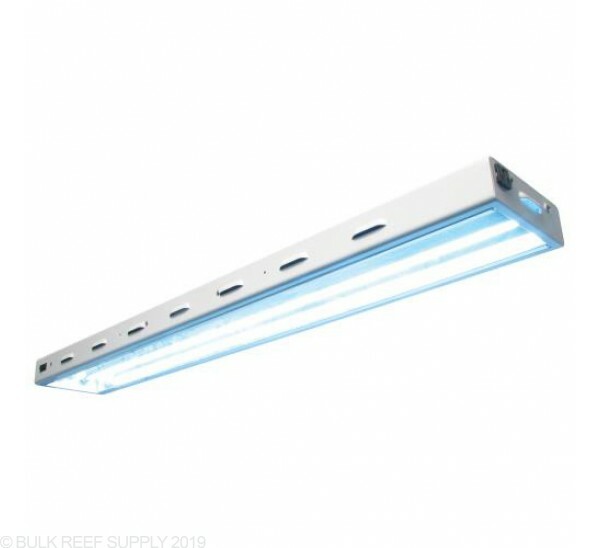 Do all fixtures come with a ballast? Or is it sold separate? These will come with the ballast and cables included in the unit's housing. Feel free to let us know if you have any further questions! What is the major difference besides the price between these fixtures and the ATI. Power difference or just build quality? Do these have individual reflectors for the 48" model? The Sun Blaze fixtures use reflectors which have 2 bulbs paired off for each reflector set, rather than individual reflectors for each bulb. I have a 75g 48x18x20 tank. Would you suggest the 4 or 6 bulb fixture? "Will be using ati bulbs". With a standard 75 gallon you can get by with the 4 bulb on a mixed reef. 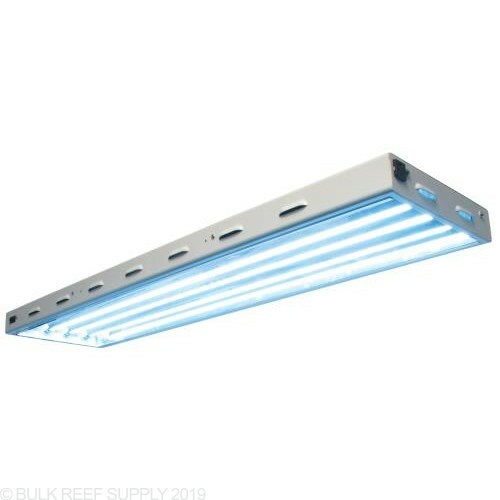 If you are looking for some good growth with higher demand corals you may consider the 6 bulb fixture. Feel free to let us know if you have any further questions! What is the width of the 6 lamp fixture please? These fixtures will not include a splash guard. Feel free to let us know if you have any further questions! What are the dimensions for the 4 bulb fixture? Thanks! How many channels (power cords) does the 6 bulb unit have? These units will run on a single power cord however the 6 bulb will have 3 channels to be turned on and off with an included switch. Feel free to let us know if you have any further questions!